Posted by Steven Bartus in Desserts, Turkish Cuisine. I’ve eaten in more than twenty cities during my travels around Turkey, and I can say with confidence that Gaziantep stands out as one of the best. Located about 50 kilometers from the Syrian border, the Arabic influence is evident in Gaziantep’s cuisine and separates it from other Turkish cities through a distinctive use of local ingredients and spicing. Gaziantep is also particularly well known for its baklava, Turkey’s beloved layered dessert. Rumor has it that P.M. Erdoğan gets his baklava flown in each week from İmam Çağdaş, the most famous restaurant and baklavaci in the city. I can understand his preference: I would make the trip to Gaziantep just for another meal at that place. Gaziantep-style restaurants are prevalent all over Turkey, but few replicate the quality of their inspiration. 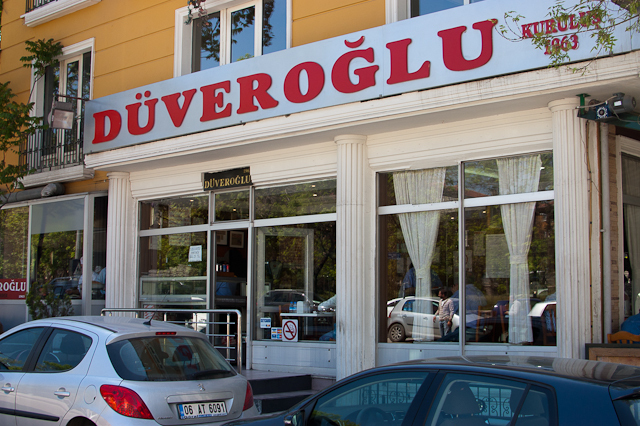 In Ankara, several people have recommended Düveroǧlu Kebap ve Baklava Salonu as a place worth trying for a taste of southern cooking in central Anatolia. So I did, three times, and was generally underwhelmed. The food at Düveroǧlu is good, but unexceptional. The kebabs are similar in quality to most other places in Ankara, although I did appreciate seeing some Haleb-inspired offerings on the menu. The lahmacun is also a bit better than most. But in general I didn’t taste anything at Düveroǧlu that evoked the culinary superiority of Gaziantep. Düveroǧlu’s saving grace is its baklava, which is admittedly quite good. It’s probably the best I’ve had in Ankara. However, this isn’t saying much since most baklava is disappointing after you’ve sampled the real thing in Gaziantep. Güllüoglu in İstanbul might be the only exception I’ve encountered to this rule. Düveroǧlu has two locations in Ankara: the main restaurant is in Anıttepe and another branch is in Kızılay (Google Maps). The prices are very reasonable. Most kebabs are priced around 10TL ($6.60 at 1.51TL/$); four pieces of baklava cost about 5TL ($3.30). Posted by Steven Bartus in Desserts, Foreign Cuisine. For the curry-loving expat in Ankara, Spice is an indispensable resource. This Australian-Algerian-Turkish-run establishment offers excellent subcontinental cuisine to a dining scene sorely lacking in variety. One should not go to Spice expecting a traditional Indian meal. As the diversity of the ownership would suggest, the cooks bring a number of distinct culinary influences to their food. And this is a very good thing. They manage to balance a healthy creative license with a strong appreciation for authenticity, delivering what I have found to be one of the most satisfying dining experiences in the city. Vegetarians, often the victims of carnivorous onslaughts in Turkish restaurants, will be happy to know that Spice maintains meatless options for their respite. My partner and I were quite pleased with the mushroom curry, a rich blend with zucchini and paneer. The spicing stuck me as something decidedly different from what I have experienced in the US or UK, but it was an innovation that clearly reflected a sort of respectful irreverence for subcontinental style. Spice also pleases those looking for the internationally beloved classics of Indian cooking. Chicken korma, lamb vindaloo and chicken tikka masala are all represented. I went with the korma and found it quite tasty, although the pieces of chicken were a bit too large for the amount curry sauce. Possibly the highlight of the meal, though, was the dessert. The sticky toffee pudding is simply amazing. If you live in Ankara, you need to try it immediately. Enough said. Spice Curry House is located on Çayhane Sk. in Gaziosmanpaşa (Google Maps). The pricing reflects its location in one of the wealthier neighborhoods of the city. Starters and desserts average about 8TL ($5.30 at 1.50TL/$), while meat and meatless entreés cost around 19TL and 12TL ($12.60 and $8), respectively. In my culinary explorations around Ankara, I’m in constant search for restaurants that successfully combine Turkish and foreign cuisines. The fusion of different cooking cultures is the basis of dynamic flavors in my experience, but far too few places in this city undertake such an effort. Ambrosia Cafe is one such establishment that breaks the mold, offering a wide array of sandwiches, salads, specials and desserts that tastefully deviate from the norms of Turkish dining. Ambrosia’s menu changes frequently to keep the offerings fresh, so check their website to view the weekly specials. For lunch this past Wednesday, I had the zucchini soup and curry-chicken börek. Both were excellent. My partner and I also tried the chili, which was average and a bit overpriced at 14.50TL ($9.75 at 1.48TL/$). The real draw of Ambrosia is the desserts. The cheesecake, in particular, is superb and without question the best I’ve had in Turkey. It’s worth making a trip to Ankara just to try it. The chocolate brownies, apple pie and tiramisu looked delicious as well, but the confines of a reasonable lunch required them to wait for another visit. 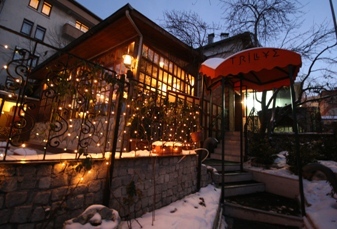 Ambrosia Cafe is located on the corner of Şairler Sk. and Nenehatun Cad. (just above Filistin Sk.) in Gaziosmanpaşa (Google Maps). Most items are priced between 6TL and 12TL ($4 and $8). Note: The cafe is open 9:00-19:00, Monday through Saturday.